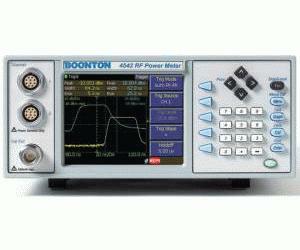 The Boonton model 4540 Series is the instrument of choice for capturing, displaying and analyzing RF power in both the time and statistical domains. Applications include pulsed RF signals such as radar, TDMA and GSM, pseudorandom or noise-like signals such as CDMA, WLAN and WiMAX. The 4540 Series is a single or dual channel RF Power Meter that can measure modulated or CW signals using peak and average Boonton Power sensors. The 4540 Series has three operating modes: Pulse, Statistical, and Modulated/CW.